Writing an essay in exam conditions can be a stressful experience. It is also quite different to writing essays at home. Although the style and structure is the same, there are many factors to take into consideration when preparing to write in exam conditions. So, how can you make sure that you get your writing right for your next exam? Scroll down and try our activities to find out! First things first – how do you get ready for an exam? Look at the image and try to identify FIVE key things to think about when you prepare for exams. Check your answers below. Exams can be stressful for everyone. To feel more confident in the exam, it's essential to reduce your stress levels. Make sure you study well in advance of the exam – no staying up late the night before! A good night's sleep and a healthy breakfast in the morning will greatly improve your concentration. You'll probably have collected a mountain of notes during your studies. It's important, as part of your study plan, to spend time organising your notes. It's a good idea to organise them by topic, and then summarise each point with bullet points. 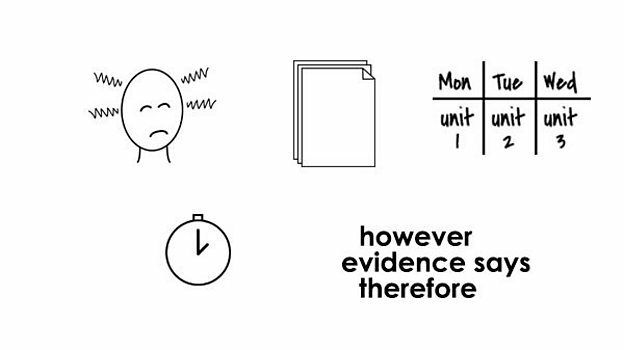 This will help you to review information and test yourself more effectively. When you're studying for a written exam, it's a good idea to make yourself a study plan. Create a timetable which shows what you're going to study on particular days, and how long you're going to study for. Remember to include breaks! Our brains are like muscles - they get tired if we overwork them. Going for a walk, doing some exercise and relaxing at home are great ways to take a break and recharge your batteries. It is also a good idea to try and remember useful language for an English essay. This can include fixed expressions to introduce points and linking words to contrast and connect ideas together. You should also review how to structure an English essay, and consider where these expressions might appear in your answer. You'll have to get used to writing within a time limit. There's nothing worse than running out of time in an exam! If you feel less confident about your writing skills, you may want to practise at home. You can time yourself to see how long it takes you to write an introduction, a paragraph and a conclusion. By practising this, you'll be more aware of your strengths and weaknesses, and which parts of your essay writing skills you need to work on. Do you know about key words? They're important to make sure you write what you're supposed to in your exams. Find out how to understand them with the next activity.